Marly’s All Male Revue continues with Stephen West of WestKnits! Stephen joined Marly from right here in Denver, however due to our crazy spring weather, they missed doing the interview face to face. (Bummer!) However, a super fun time was had by all! Stephen West is originally from Tulsa, Oklahoma. After moving to the Chicago area, he caught the knitting bug and started designing patterns while epic amounts of wool infiltrated into his life. There was no looking back. He moved to Amsterdam two years ago to study Choreography at the School for New Dance Development and he travels frequently teaching knitting workshops throughout the United States and Europe. 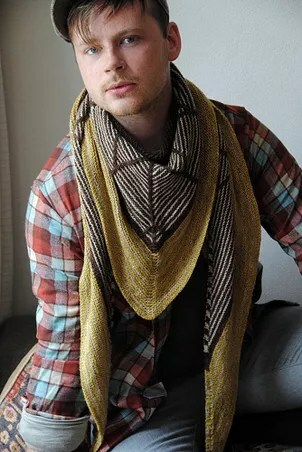 He creates his own series of popular self-published pattern collections and also designs for Malabrigo Yarns and knitty.com. You can find Stephen on his website, Twitter, Ravelry and his Facebook. This week, Stephen and Marly gave away a copy of one of Stephen’s books as well as an advanced copy of his Craftsy.com class, coming out in about a month or so! Now, if you listen to Marly’s show at all, you know that there aren’t just on the air giveaways, there are post show giveaways, and this week is no exception! Leave a comment in the thread below, and you will be entered to win a free e-book from Stephen! Don’t forget that keyword! Up next week: Franklin Habit! No doubt that Stephen West is more than a popular designer. He has such an enthusiastic and large following, I believe he’s created a movement! A total phenomenon! Love every design of Stephen’s I have created. Always get complements. It was so interesting to hear how Stephen changes his designs as he goes, based on the drape and movement of the fabric he creates. I’ve only heard good things about his designs, can’t believe I haven’t tried one yet! I enjoyed your interview with Stephen very much…in fact, it inspired a haiku. Iceland. Amsterdam. . . Jealous. Well I’m so excited to cast on a design by Stephen West. I have his first and third book and I hope to collect all of them. I just found the right yarn to start a pogona. He definately has caused a “movement” in the knitting community. Also, I met him when he came to California last year and he is so genuinely sweet, kind and handsome. Love his designs and wishing him all the success and happiness in all his future endeavors. Another great interview! Stephen is at the forefront of the young designers movement, with fresh and practical designs. Thanks for the chance. Love West’s designs. I didn’t know that he was into the movement of dance. Fun interview! I love how Stephen incorporates movement into his designs. I haven’t knit designs but I’ve been looking at a few. I like the movement and swing of some of the shawl designs. I love your interviews. Stephen always creates such great movement in his designs. That was a super fun interview! This was one of my favorite shows. I’ve always said his models seem to be having so much fun on photo shoots and it really shows. I just finished Pogona and ready to try more! Almost forgot MOVEMENTS! I think he started one! This was my first taste of Stephen West and i love it! The movement of his garments is fabulous! Love the all male revue! Great podcast as always! Thanks for having Stephen West on. His patterns are always pleasing to make and wear. Have already made 2 projects out of his Made for Movement book and can’t wait to make more. Thanks! Great show, nice to ‘meet’ Stephen West. And then thank you for pulling my name from last week! ~ deliberately not saying the secret word, because I don’t want you to pull my name since you just did. Just saying thank you!!! There really has been a Stephen West movement lately! I’m so glad you had him on the show…I love his designs! Enjoyed the podcast with Stephen West. It’s exciting to see him part of a movement of bringing more men into the business, creating things both for men and women. What a super interview with Stephen West! I appreciate how the patterns and designs he creates with simple changes in stitch and color. If you want to see great movement with his designs, one must look at the photos of Bolting. I love them! Loved the movement of your interview with Stephen. So interesting. I’d love to have more movement in my knitting! Great conversation, as usual! I want to be part of the Stephen west movement! Love Stephen West designs! Knitting such beautiful projects makes the movements of my needles so much more fun. I love knitting things that have a movement of their own, it could be from the design or from the fiber selected. Stephen West has made an art of combining the two. Thoroughly enjoyed the interview with Stephen West. I would like to knit any of the patterns from the “Made for Movement”. I think I’m going to start a movement with my family and friends – let’s all knit Stephen West patterns! Oh, wait… we’re already doing that! His patterns have great movement. I love movement and color in my shawls! Stephen is a genius! Can’t wait to knit some of his great cowls and get some movement into my knitting! Love your supporting the male designer movement. The interviews have been great.